So, time to raise a Private View glass of probably-questionable wine to the last days of 2013, and look back at another year. To those who complain about Coventry in particular being a cultural desert it’s worth pointing out again that I’ve filled 52 weeks’ worth of columns with reviews of art exhibitions, plus short bits about art-related activities, and longer pieces and interviews on this blog. Yes, not all the exhibitions may have been world class but there’s a lot going on around here and new quality artists keep emerging. One of the best bits about doing the column is going to many of the private views, or opening nights, and also experiencing some other whacky one-offs. An exhibition by two artists has found new ways to focus on the legacy of post-war modernist architecture in Coventry, and both are fascinating in their separate ways. 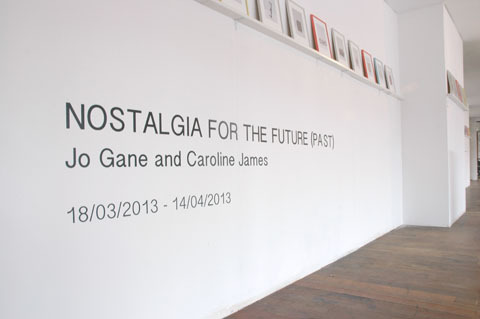 Jo Gane and Caroline James, who met on the London College of Communication’s photography MA course, are exhibiting in Nostalgia for the Future (Past) at the Roots Gallery in Coventry city centre.